Jazz Carlin and Georgia Davies transformed Welsh swimming's fortunes at the 2014 Commonwealth Games, and now they are the inspiration for a new generation. After waiting 40 years for a Welsh woman to win swimming gold, two came along at once in Glasgow. Carlin became the first Welsh woman since Pat Beavan in 1974 to win a Commonwealth swimming title when she eased to victory in the 800m freestyle in eight minutes 18.11 seconds. The next day, Davies broke the British record in a time of 27.56 seconds to win gold in the 50m backstroke. Now the latest crop of Welsh swimmers hoping to emulate Carlin and Davies are preparing for the Commonwealth Youth Games, which take place from 5-11 September. A team of seven - five female and two male - swimmers will travel to Samoa for these Games, inspired by Wales' success last summer. Mari Davies is the only member of Wales' Commonwealth Youth Games swimming team who competed at 2014's senior games. The 17-year-old from Caernarfon swims in the 50m and 100m freestyle and relays, and is hoping to benefit from last year's competition in Glasgow. 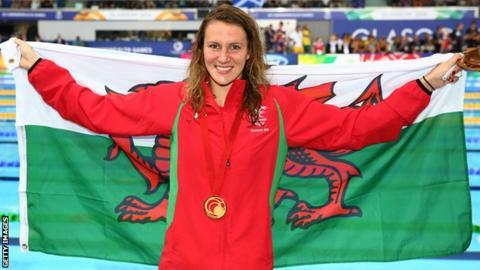 "I learned a lot from that experience, being part of the most successful Welsh swimming team," says Davies. "Being on the same team as people such as Jazz Carlin and Georgia Davies, seeing how they prepared for their races, I learned a lot from that. "I'm really looking forward to it because Samoa is such an obscure place - it should be a unique experience." At just 14 years old, Bridgend's Rebecca Sutton is the youngest member of Wales' swimming team - and she has some pedigree. Sutton won silver medals in the 400m medley and 4x100m medley relay at this year's Youth Olympics in Georgia. "My hope is to get to the Tokyo 2020 Olympics," says Sutton. "Knowing that Jazz Carlin and Georgia Davies trained in Swansea, they're really inspiring to me. "Hopefully I can train somewhere around here, try and stay at home and be a home bird. "I'm just going into year 10 and starting on my GCSEs so I'm going to have to juggle a lot of school work with swimming." Another of Wales' swimmers with experience of major youth competitions is Sophie Evans, a 16-year-old from Aberdare. "I'm really excited - it's a once-in-a-lifetime opportunity," says the 800m and 4x200m freestyler. "I've done two European Junior Championships and one World, so I'm quite experienced in competing against people from different parts of the world. It is a big help. "It'll be different to be with athletes from different sports, which will be a nice change. "I'd love to get a medal, swim faster than I ever have done and build on my other experiences." Swimming one stroke at different lengths is enough of a challenge for most, but Emelia Stevenson will be competing in two strokes at various lengths. The 17-year-old from Aberdare will swim in the 50m butterfly, the 800m freestyle as well as the relays. "It's easier to juggle them because they're different strokes," she says. "Jazz Carlin has done so well recently and, even though in the past she didn't do as well, it shows if you keep working and don't let it set you back, you can get to where you want to be." Another member of the Wales team with an aptitude for different disciplines is Dan Davies. The swimmer from Haverfordwest will take part in the 200m and 400m freestyle, as well as the 200m medley. "I'm really excited and feel lucky to be going. I've been on training trips but not competing at this international level," says Davies. "I've had a really injury-filled season. I feel a lot better and I've come through strongly recently." Born in Guildford, Surrey, but feeling "fully Welsh", 18-year-old Joe Clark is the senior member of Wales' swimming team. Clark is another versatile competitor, taking part in the 100m, 200m, 400m and 1500m freestyle. "I've always supported Wales in rugby and most sporting events so I consider myself fully Welsh," he says. "I'm looking to step up and compete against the best in the world." Another of Wales' team born in England but wholeheartedly committed to the Welsh cause is Kathryn Greenslade. The 17-year-old from Preston will compete in the 100m, 200m and 400m freestyle as well as the 200m medley and relays. "My father's side of the family is from Cwmbran," says Greenslade. "I'm looking forward to it. It'll be a great experience." Catrin Jones, Bangor, Gwynedd; Ellie Pryor, Aberdare; Jordan Sakkas, Cardiff; Matthew Story, Cardiff. Richard Hernandez Tong, Cardiff; Joely Lomas, Swansea; Rebekah O Loughlin, Llangynidr, Powys.